Every time August comes around, another Madden game is released, almost like clockwork. Like most sports franchises, you expect to see incremental updates, such as new rosters, and evolutionary, rather than revolutionary, feature changes. So, Madden NFL 18 came as a genuine surprise with its first-for-the series campaign mode. We were able to play through the beginning of the story mode, and here are our first impressions. EA walked us through the very start of the game. The campaign, titled “The Longshot,” is going for a complete cinematic experience. In fact, the first several minutes (perhaps even as long as 10 minutes) of the game hardly has you playing much of anything. Developer EA Tiburon takes their time to set the stage. You play as Devin Wade, who is reminiscing about various key moments in his life, played through flashbacks. The very first interaction you have when controlling Devin is as a young kid, playing a mock game of football in the yard. The only gameplay prompt involves a few quick-time events, which allow you to throw a perfect spiral at your friend, and control the ball mid-flight using the left stick. We were told that some of these game mechanics are only used once throughout the campaign. Next, we are tasked with playing through a monumental high school game of Devin’s, where he is substituted in on a game that his team was well behind on. Here, he is not expected to win, but overcomes amazing odds and does so, setting off a chain reaction that inevitably leads to Devin being drafted into the NFL. This outcome is not a given, though — the story branches, and based on your decisions, you may not even make the cut, but more on that in a bit! Since you are playing as a high-school student starting out, there is no playbook to call from; your coach handles all playmaking decisions. It is up to you to execute the plays. The high school game is played drive by drive. If you don’t score a touchdown in each drive, you fail. However, the game merely sets you back to the beginning of the current drive, giving you another shot and not causing you to lose much progress if you do fail. The Longshot mode has accessibility and entertainment in mind, more so than presenting a large challenge – there’s all of Madden’s other modes, with high difficulty settings, for that. Lead Gameplay Designer Josh Looman did indicate that this game mode is designed to help those who are unfamiliar with football in general, and as the campaign progresses, more complex gameplay mechanics are introduced slowly. One cool area that this was evident was in the commentary of the high school game. Using a completely different feeling for the high school setting, the commentators were more laid back, and reacted to each play in ways that were also helpful for someone who might not know a lot of the more nuanced elements of football. For instance, I threw an incomplete pass into double coverage, and one of the commentators scolded me for that, but also offered advice on looking elsewhere if I see a lot of the other team’s color near my teammate. This is still a Madden experience, but without any of the spectacle of the NFL – though there is plenty of drama. At certain points in the story, Devin will be presented with choices to make. A scouting report tracks your progress, and you are rated on not only your football performance, but also on your decision-making abilities. For instance, choosing to prank someone with a phone may result in a negative mark on your scouting report, indicating that your decision=making process needs work, that you may have anger issues, etc. It almost makes The Longshot a choose-your-own adventure story. Madden NFL 18 runs on the Frostbite engine, a first for this series. 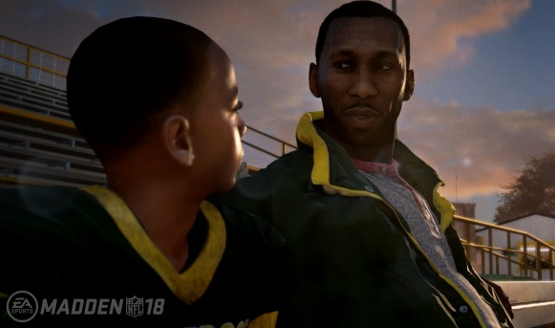 We were told that what we were seeing could simply not be done on Madden’s older Ignite engine. It’s pretty simple, when you think about it. The Ignite engine was built for a sports game, whereas the Frostbite engine may have started as geared towards first-person shooters, but as those have expanded their cinematic storytelling approach, so, too, has the engine. Frostbite is a very mature engine by this point, so textures are crisp, lighting is great for cinematic storytelling, and player animation is solid. Facial expressions look believable enough, though there’s a little bit of the uncanny valley effect going on that’s almost expected these days as games get more and more realistic-looking. 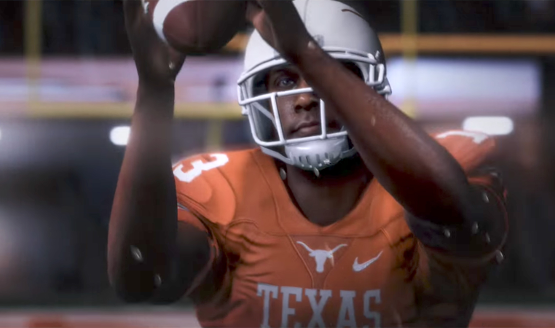 Still, just going on presentation alone, this is an impressive new direction for Madden. For the first time, it seems that Madden NFL 18 will be a game that invites non-football fans to sit down and watch the game. For those diehard fans who buy the game every year, there are still the traditional game modes to play through. It appears things are working towards Madden finding a new audience, after years of updates that were perhaps a bit too pedestrian. Madden NFL 18 is currently huddling in preparation for an August 25, 2017 release on the PlayStation 4 and Xbox One.